Inside Diameter: Required ID=1/2" ID=3/4" ID=1" ID=1-1/2" ID=2" ID=2-1/2" ID=3" ID=4" ID=5" ID=6" ID=8" ID=10" ID=12" ID=14" ID=16" ID=18" ID=20" ID=24" ID=30" ID=36"
Stub Length: Required L=9" L=12"
I was in a major need of a 6" stub flange, they didn't have it in the flavor resin/cure that i was looking for but did with a different cure system. I ordered it with a next day air shipping option, the flange came in the next morning and got me out of a jam. The quality of the flange was outstanding, i have yet to order a product and feel that i needed to return it. Now that they are carrying bolts and gaskets, they are my one stop shop. Thank you guys for making my job so much easier. 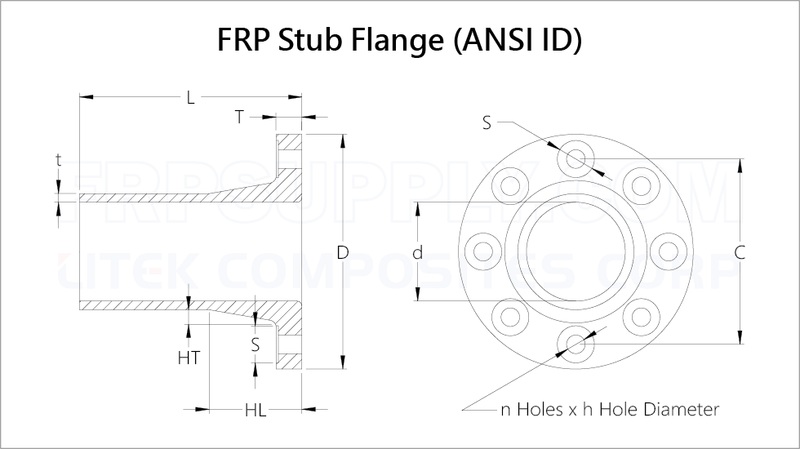 Very good quality flanges. I worked at Xenon Co. where we made flanges and tanks etc. These flanges are top -notch and very cost effective.Good delivery on stuff I've order. High Quality and Fast Service.